I hit when my frustration level was too high to quickly think of something else to do. Reprinted with permission from Kveller.com. In my opinion, it is always wrong to spank your children. Even a single shmeits (Yiddish, slap). And let’s call it what it is: spanking means hitting. “Giving a spanking” means hitting repeatedly. It is an abuse of parental power and teaches the use of physical violence to solve problems. In my own experience, I remember the few times I hit my kids. And I was wrong. I don’t recall spanking daughter #1 (and neither does she) but my husband spanked her hard once when she was about 5. I remember getting into bed with her afterwards and sleeping there for the night. I barely talked to my husband for two days, I was so distressed. I shmeitsed son #1 when my very pregnant body couldn’t grab him (at 2 ½ years old) before he ran into the street. I shmeitsed daughter #2 (I think she was about 6) when she broke a bottle of red nail polish all over the bathroom floor after several warnings. There were still stains between the tiles when we moved out almost 20 years later. Son #2 (probably around 4 years old) got it when he broke an expensive doll after having been warned away from it. I recall giving him a shmeits another time, too. Something having to do with lying and cookies, but we don’t remember the details. But I was wrong (except maybe with son #1). I hit when I was very angry and my frustration level was too high to quickly think of something else to do. I felt horrible that I had “lost it” and hit my child. And I regretted not having been able to restrain the impulse. I myself was a good little girl but occasionally got in trouble for fighting with my younger sister. I was hit on my tush or my arm by my mother who yelled a lot and was angered easily and often. When my husband was young, he would get, “Wait until your father gets home!” from his mother and when his father did get home, he would be hit across the tush with a belt. Horrible. Just horrible. (And impossible to picture my beloved, gentle father-in-law doing it.) The premeditated kind of spanking somehow seems so much worse than the impulsive shmeits. Long ago, when we were all young parents, our friends visited us with their two small children. The little boy hit his older sister. In a flash, the father, a psychologist no less, grabbed the boy, threw him over his knee and gave him a spanking while yelling, “We do not hit! We do not hit!” (True story.) My husband and I were flabbergasted. Renée Septimus is a social worker and Jewish educator. 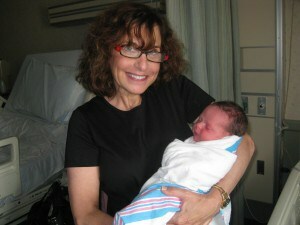 She lives with her husband Joe on Manhattan’s Upper West Side and is the very proud mom of four married children and a savta (that’s Hebrew for grandmother) to a (growing) bunch of absolutely perfect grandchildren!